Mummy: Tomb of the Pharaoh is a first person perspective adventure designed by Amazing Media, the same team who brought us Frankenstein: Through the Eyes of the Monster. This one is set in a mining camp in modern Egypt and, of course, as the game opens, trouble is well and truly brewing. Mining operations are at a standstill because a strange casket has been unearthed, spooking the workers and inviting the unwelcome attention of the Egyptian authorities. You play the character of Michael Cameron, a facilitator, flown in to sort out the mess and get the show back on the road. Step off the plane and you are in the thick of it. On the tarmac you'll meet the first of the camp personnel and this and all such encounters are presented in video sequences. Your responses are automatic so you have no opportunity for conversational input. However, the acting is quite respectable overall and, after your first conversation with Stuart Davenport, the camp leader, (played by Malcolm McDowell) the video sequences are succinct and don't interfere with the flow of the game. Mr Davenport is not at all happy to see you, and just in case you don't get the message the first time around, he'll pop in on you periodically to reinforce his feelings. Don't be mislead by the title of this game, Mummy: Tomb of the Pharaoh is not so much about mummies and curses and mysterious tombs as it is about greed and megalomania. Although you do finally end up exploring an ancient tomb the larger part of the play is centred around the mining camp itself and then down in the mine with its circling tunnels, elevators, conveyor belts and rail cars. You must firstly explore the camp thoroughly and meet a few of the other characters. As you haven't received the red carpet treatment you are petty much on your own here, so this is where your problems begin. Before you really get down to sorting yourself out, however, a good sleep is essential, and when you awaken things have taken a turn for the worse. You will soon find yourself grappling with a pitch black mine, a sudden death as well as a good number of locked doors and sabotaged equipment that demands your attention. The problems presented are fairly straightforward, especially at the beginning of the game. They relate to mostly quite familiar objects that are manipulated in conventional ways, so nothing is too difficult. Also, because the gameworld is not large, essential items to help you out are never too far away. The mine, I thought, was the most time consuming part of the game, and not because of the abundance of puzzles but because of the difficulties of navigation. It is essentially a maze comprising six levels, and even with a map it's not always easy to pin-point your position. Also, at the end of your exploration of this area you are faced with a race against the clock to avoid being buried forever, so, unless you are very, very lucky a few episodes of dying are inevitable. The final section of the game is set primarily in the tomb and also includes a small maze. Of course, the problems here are to do with less familiar objects, so they are more difficult to overcome. One in particular requires the trial and error approach, but there are not too many to hold you up for too long before you are back in a more modern day environment again and ready to complete the game. 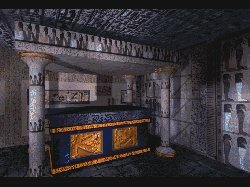 Mummy: Tomb of the Pharaoh is a Windows game so the save game feature uses the standard windows interface. A tap of the space bar toggles the Windows menu off and on from where you can save and restore, quit to the opening game screen, and do such things as adjust the transition speed or switch the video interrupt setting off and on. Take note of this latter feature because if you forget to disable the video lock you may find yourself repeating a section of the game with no escape from the video sequences that you have already sat through a couple of times before. The game comprises one CD and there is no text option. It has a very simple mouse controlled interface, almost identical to the one used in Frankenstein. The cursor takes the form of a hand with a pointing finger. You just click to travel or to zoom in on an object. When there is something to be done, the cursor changes to a grasping hand. Your inventory is a bag which you must pick up at the beginning of the game, it isn't too difficult to find. Items are simply dropped into the bag and an arrow allows you to scroll through the contents so you can access inventory items. Mummy: Tomb of the Pharaoh is a fairly average adventure game, not too long and certainly not complicated in any way. Most experienced players will find it very easy and it won't take up too many hours of game playing time. Because of the ease and familiarity of the problems it is best suited to novice players. I say this because you don't have to be too devious to solve the puzzles, inventory items don't have to be manipulated in any way, and mostly everything you find is just as it seems and must be used precisely in the way it is meant to be used. Having said that, I must admit I was disappointed in this game and this wasn't only because I was expecting to be delving into the mysteries of ancient Egypt rather than sorting out problems in the 'real' world of mining camps and darkened mines. Even as an adventure set in familiar (or modern) surroundings, Mummy: Tomb of the Pharaoh simply doesn't manage to sparkle or intrigue. Somehow the mystery is lacking and, unlike Frankenstein, the atmosphere doesn't set your teeth on edge. This is mainly due to the standard storyline which has very little depth or sophistication ... and it's hardly subtle. The 'baddies' show their cards from the first moment you meet them, so there are few surprises in store.